I don’t know why, but cooler temperatures make me want to eat granola. Last year it was cinnamon granola with coconut oil. Before that it was cranberry orange granola. And before that it was strawberry chocolate granola. This year, it’s chocolate peanut butter granola – which (in my humble opinion) is the best flavor I’ve made yet! Actually, I take that back. It’s tied in first place with a version that I like to call “almond butter trail mix granola” which is really this same recipe, using almond butter instead of peanut butter (because I ran out) and adding about ¼ cup of everything I have in the pantry because I ran out of oats. I’ll refine and share that recipe with you one day, but until then, chocolate peanut butter granola is going to have to work… but friends, trust me when I say this… WE ARE NOT SETTLING! They’re healthier than you thought they were, and it’s nice to take a break from the traditional bowl of oatmeal now and then. You could use quick cook oats instead of rolled oats here if you’re in a pinch, but I wouldn’t recommend it. 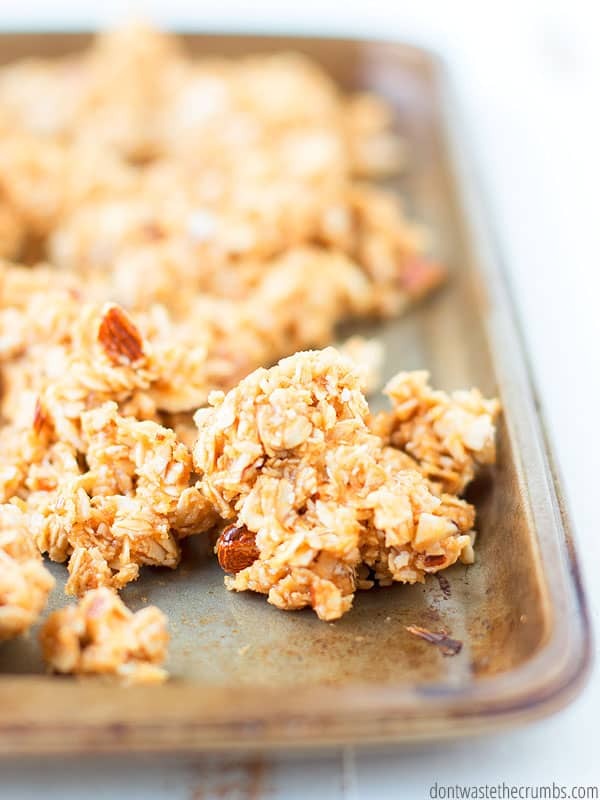 Quick cook oats are smaller in size than rolled oats, so the oats won’t exactly be prominent just by looking at the granola. I’m afraid the flavor might get lost too. Also, because they’re so small, any pieces of oats that don’t make it into a cluster will feel like a bunch of crumbs rather than granola. Sure, we could go ALL OUT PEANUT here and use peanuts instead, but the subtle taste and massive crunch of almonds just works here. I started with whole salted almonds and chopped them myself. If you have leftover sliced or slivered almonds from holiday cooking and baking, this is a GREAT way to use them up. Measure the almonds first, and then chop them up. These are the big pieces of coconut, not the typical coconut flakes that you use in baking. I bought it back when we were on the Whole30 and my kids were eating Monkey Salad (banana + cashews + coconut chips) as an afternoon snack. They still like snacking on coconut chips, so I buy a bag now and then. Maple syrup is pulling double duty here – it’s part sweetener, part glue. I find that the maple syrup is very subtle and nearly unnoticed in baking recipes, where I can definitely taste honey when I use it. Because I want this chocolate peanut butter granola to taste like peanut butter and chocolate, I opted for maple syrup. You can easily substitute honey though. Our oven temperature is low enough where you shouldn’t have to worry about it burning. I tried one batch with vanilla and one batch without and I had no idea that the ½ teaspoon would make such a difference. It does though, so please include the vanilla if you have it. If you’re out of homemade vanilla extract or want to try a more frugal option, check out these 15 ideas for vanilla extract substitutes. TA-DA! This my friends is where the magic happens. 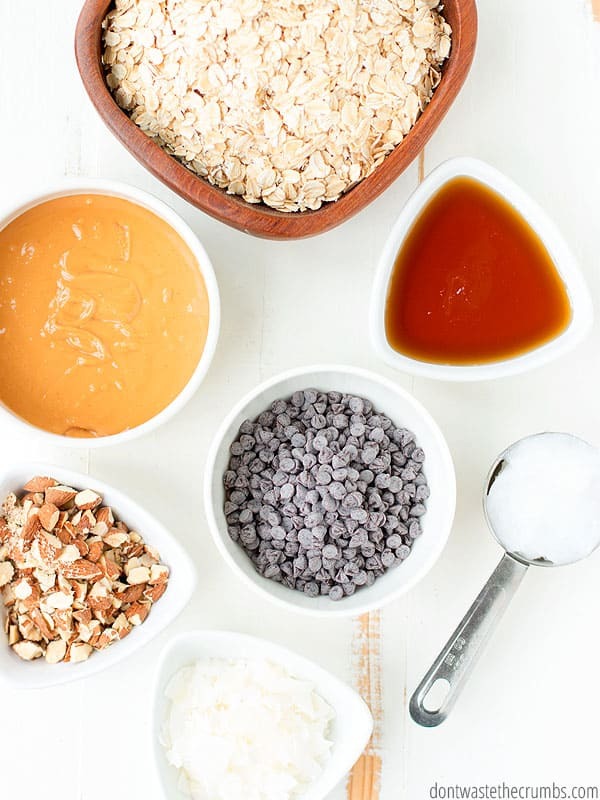 This is how you turn plain Jane granola into granola CLUSTERS – which I think are absolutely necessary. I mean, if I’m walking through the house with a fresh batch of chocolate peanut butter granola cooling on the counter, how in the world am I going to be able to sneak a handful without everyone hearing me unless they were in big huge clusters? You need the egg white, friends. Psst – need ideas for the extra egg yolk? Make carbonara. Or my world famous scrambled eggs. Or homemade eggnog. Or an eggnog smoothie! Ah yes, the star of the show! You can pretty much use whatever peanut butter you want… plain, smooth, crunchy, salty, honey-flavored… whatever. But make sure that there are NO added sugars and NO hydrogenated oils added. Both are not good for you and take a very healthy real food and turn it into junk food. You want peanuts and salt listed for sure. Palm oil is optional. Anything else and the red flags in your brain should go off. Let’s be honest – we’re only making this recipe because it has chocolate, right? I thought so. I’ve tested this recipe with milk chocolate (yes), semi-sweet chocolate (yes), semi-dark chocolate (yes) and super dark chocolate (yes yes yes). Every variation was amazing and worthy of making (and eating) again. Choose a lighter chocolate (i.e. milk or semi-sweet) if your family is used to things being on the sweet side. Go for a darker chocolate if you’ve weaned your people from sugar, or if you’re looking to find that balance between sugar and homemade treats. You know what would also be fun? White chocolate. Or peanut butter chips. Or cinnamon. Or sea salt caramel (which I MUST try!). I used my Kitchen Aid mixer to make this because it’s way easier and it’s one of the 30+ awesome ways to use it (besides just cookies and cakes and such). If you don’t have a Kitchen Aid mixer, you can use a really big bowl. Always use a bowl that’s a size too big when you make granola, because you need the space to move ingredients around. If I use a bowl that I think is “just right,” I ALWAYS end up with half of my ingredients splashed onto the kitchen counter. So let’s avoid that and just go for the super size bowl. Chocolate peanut butter granola is addicting. You’ve been warned. This takes 40 minutes in the oven with one turn halfway. Don’t leave the house and use the kitchen timer so you don’t burn the granola. (Which tastes AWFUL, by the way.) Since so much of the time is hands-off, I recommend making this when you’re already doing something else in the kitchen. 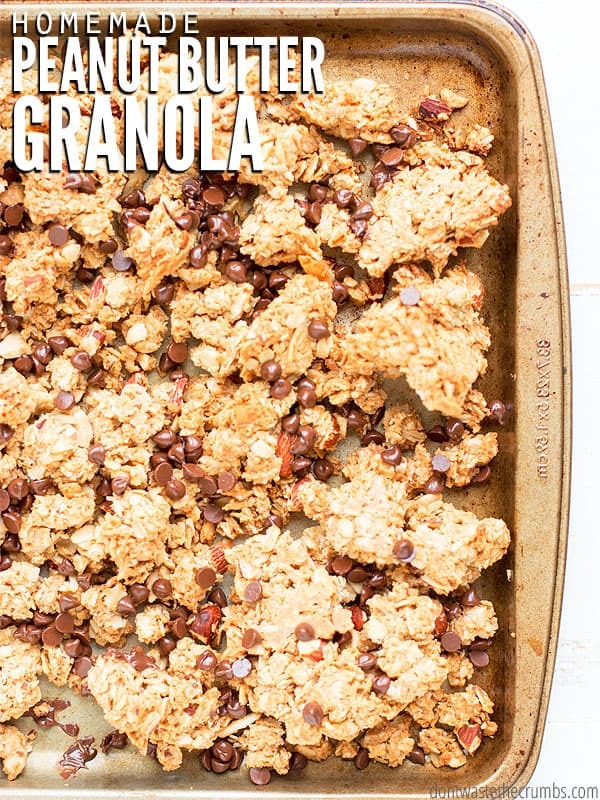 You’re going to very carefully flip the granola ONCE. Other than that, DO NOT TOUCH THE GRANOLA. It’s one of the three ways you get awesome clusters (the other two being using an egg white and letting the granola cool completely). Besides the obvious snag-a-cluster walk-by, chocolate peanut butter granola is great for breakfast, snacks on the go, or even dessert! This also makes for GREAT teacher gifts! We gave some to a teacher for her birthday and she loved it! Add all the wet ingredients - maple syrup, coconut oil, vanilla extract, egg white and peanut butter - to the bowl of a stand mixer (I've had this Kitchen Aid mixer for 10+ years!) or in a very large bowl. Use the paddle attachment or a whisk to ensure all the wet ingredients are thoroughly mixed together. 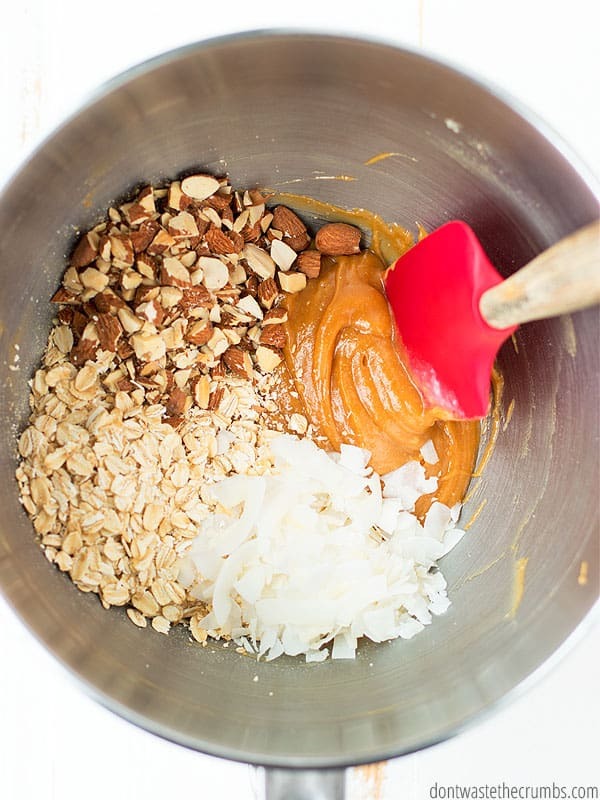 Add the oats, coconut chips and almonds and again, mix until all of the oats are thoroughly moistened and covered in peanut butter. Working in sections, very carefully flip the granola over, doing your best to not break up the large clusters into small pieces. 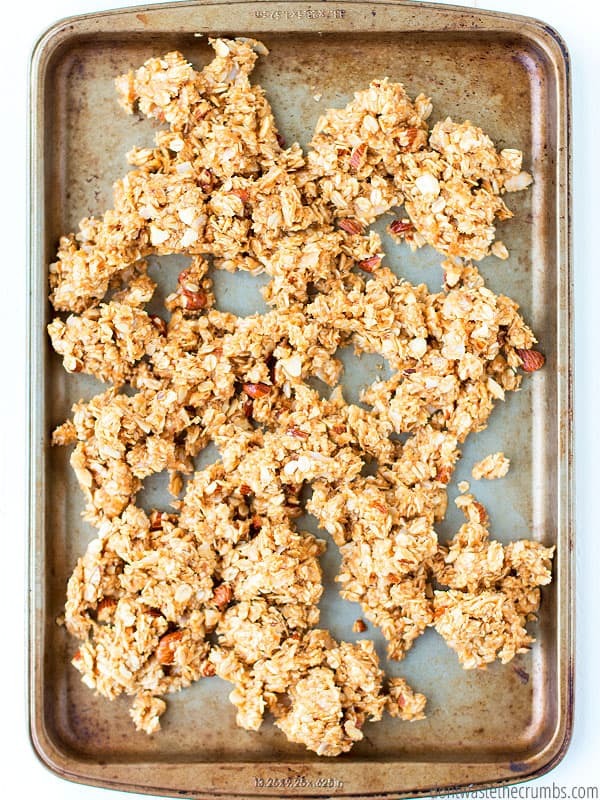 Gently push the granola towards the center of the sheet pan. 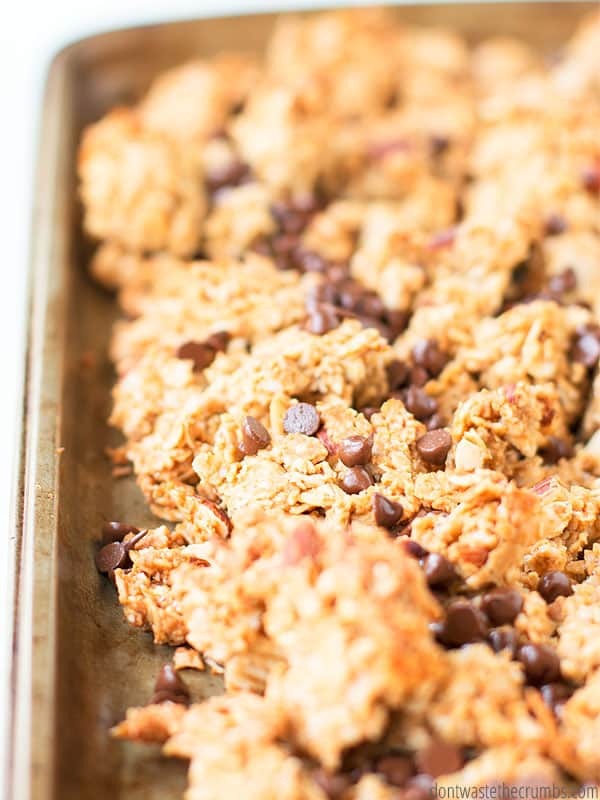 Sprinkle the chocolate chips on top of the granola and bake in the oven for another 20 minutes. 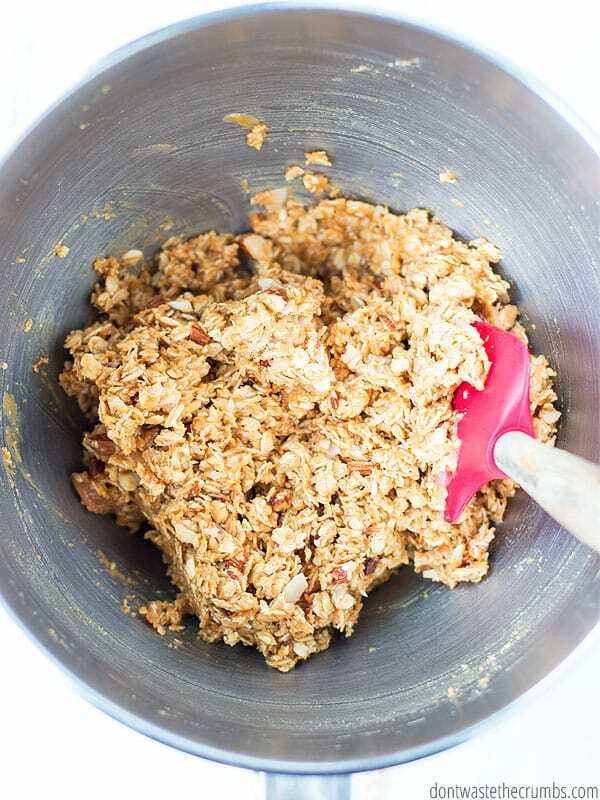 Remove the granola to a cooling rack to cool completely before storing in a container with a lid. You can store it at room temperature for several days, but I recommend storing it in the fridge FIRST to give the chocolate a chance to harden again AND to help create even more clusters. I usually buy my oats, eggs, almonds, peanut butter, and maples syrup at Costco. I’ve compared prices with ALDI and Walmart and they come out on top for these items. Coconut oil is best in bulk. I buy from Tropical Traditions when they offer FREE shipping or buy one get one half off sales. Vanilla is tricky with the high prices. I typically make my own vanilla extract or use one of these substitutes. I recently discovered great chocolate at Trader Joe’s, so I stock up when I go there. Coconut chips are little harder to find but have seen them at Kroger and Trader Joe’s or online at Vitacost and Amazon. What’s your favorite flavor of granola? Do you eat it like cereal with milk? Or do you add it to yogurt? Tell me all about it in the comments! Have you tried making this as bars? My kids go crazy for bars in a way that they don’t for cereal. The same thing happened here! !